I’ve been on sabbatical from my writing and on April 21 it will have been six months since I felt the urge to write. The events which unfolded after October 16 2017 made me reconsider why I write and why I put myself out there, not just on this blog, but also on social media. 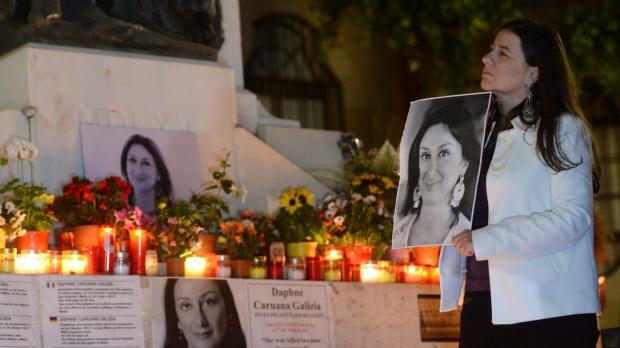 It wasn’t the brutal murder of Daphne Caruana Galizia which stopped my writings, but what happened after. An investigative journalist was blown up, assassinated, her life taken and her charred body found by one of her sons, and from where I was standing it looked like most of the country didn’t care. Activists were bickering amongst themselves, politicians were bending over backwards in the hope of getting political mileage from this terrible event, many people stayed silent not to put their iced buns into jeopardy, others even went on the attack, because in this climate of ours, political favour is a lot more important than one’s integrity. Positive things did come out of the event too. TheShift News, an independent news portal, was set up. Occupy Justice, a pressure group headed by an all women team, came to be and is still going strong. But it felt, and still feels, like this wasn’t enough. Not even death managed to jolt the country, my Malta, into action, even if that action was some form of debate about how rotten state of affairs are and how something needs to be done now, because journalists being blown up in cars, is not normal in a democracy. There were no resignations from the government’s part. Not that resignations would mean anything other than some government culpability. Yet this proud government of ours still believes they have nothing to do with the sequence of events which led to a journalist’s murder. Yet they do, and in six months some of the behaviour coming from people within government has been anything but commendable. On Sunday morning, the Prime Minister went on record to say that people will be giving a reply to the Daphne Project on May 1 when the crowds gather at Triton Square. In which democratic country is a government absolved by showing off its support? This is not a popularity contest. There is government corruption at the highest levels, and thousands of people showing up at a mass meeting is not going to make that go away, especially when you have some of the world’s fiercest investigative journalists on the case. And what is Joseph Muscat thinking he is going to achieve exactly by rallying the masses? Everyone knows he has the support and that he has a mandate to be Prime Minister. No one is denying or even challenging that. On the contrary. Those protesting and speaking up want the Prime Minister to do what he has been elected to do, and that is, clean up the government and start working on cleansing the country from corruption. After all, if an election was to happen tomorrow, the Labour Party would win by another landslide. There is no current opposition and frankly, I trust Joseph Muscat to run the country more than I would Adrian Delia (and yes I know what I am saying). So what drove me to start writing again? Two things happened on Sunday which disturbed me deeply. First it was the news about the vile act on Stefan Zrinzo Azzopardi, where a dead cat was placed on his doorstep. This is a truly cowardly act and I have to commend Zrinzo Azzopardi for the way he dealt with this and the words he chose in his reply. There are myriad other ways to show your displeasure with the government. The second, was another vile act, again from people hiding behind anonymity but whose allegiances are clear. PL supporters started spreading images of one of the people who was present at the protest in London. Reports from LovinMalta even stated that her ID card was being shared on the social network. These posts call her a traitor of Malta and encourage others to share the post in a shameful social media bullying exercise. At the time of writing, there has been no condemnation of these acts by the government, even though in any normal democracy the government’s communications team would be quick to distance themselves from such a cowardly act. But the more time passes, the more it feels like we are not living in a normal democracy. The memorial of a murdered journalist being cleared in the dead of night is not normal. A Member of Parliament, who is also communications aide to the Prime Minister, and who has a blog which he uses to intimidate private citizens with, is also not normal. The chairman of Valletta 2018 - the one who is supposed to nurture culture and the artists - shaming an artist for a crude satirical sketch loaded with political commentary, is not normal. Being targeted and called corrupt because you happen to hold a chairmanship under the current government is also not normal. Branding people who protest as traitors of the country is not normal. It’s time to put our differences aside and dig deep. Something is rotten and this will turn very ugly if the first reaction to anything we don’t like is to shame, intimidate and harass. Attack the argument, not the person. Do not dehumanise someone simply because you don’t agree with what they say, and if you see someone doing such things, speak out, even if you’re on “the same side.” If you’re not able to do this, then simply scroll along. Hate will not get us anywhere.